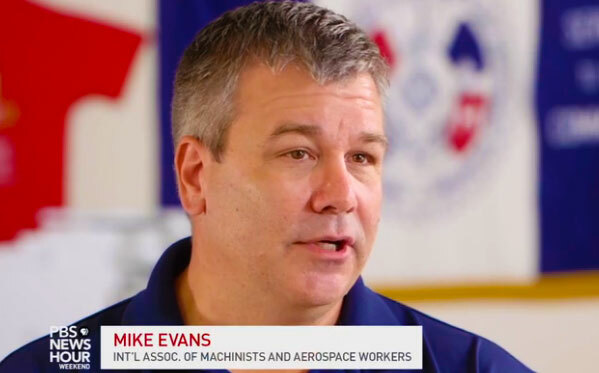 A recent PBS NewsHour Weekend video story highlights the IAM’s effort to bring respect on the job to Boeing workers in North Charleston, SC. Support for IAM representation, like workers have at Boeing facilities in Washington State, is growing at North Charleston’s 787 production plant. PBS points out one reason why—the drastic pay difference between a union worker in Washington State and a non-union worker in South Carolina. An IAM-represented Boeing Assembler Mechanic makes $38.61 an hour after six years on the job. In South Carolina, non-union Boeing workers building the same plane make only $22.62 an hour. “The wages and benefits [in Washington State] are much better than what they’re experiencing here in South Carolina,” said Mike Evans, an IAM Special Representative and the campaign’s lead organizer. Without an IAM contract, Boeing workers in North Charleston frequently see their work being done by part-time, temporary contract workers. This jeopardizes the full-time workforce, and raises safety and productivity concerns. But with an IAM contract, “our Everett plant doesn’t allow temporary workers on the production line,” said Evans. Learn more about the Boeing South Carolina campaign at BoeingWorkers.com.